This interview forms part of the Blueprint According To... series, the bonus edition of Blueprint for Football Extra. If you’re on Twitter and hold even a minimal interest in football coaching then it is virtually impossible not to have heard of The Coaching Family. 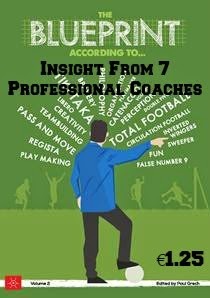 This account set up on the social network aims to bring together football coaches so that they can share ideas, tips, advice and even sessions. It has grown into a very powerful tool for coaches to share their views and sound out others when they’re uncertain about anything. Ben Trinder was the main man behind the setting up of this page. An FA Level 2 qualified coach from Berkshire, he is currently working towards gaining his UEFA B coaching licence while also working towards his FA Youth Award assessment, having completed all 3 modules of the course. Ben coaches at grassroots level with Ascot United under 14′s who play in the Surrey Youth League, he also coaches with a Premier League club in their Academy Development Centres on a part time basis working with children from 5 to 8 years old. Blueprint for Football: Let's start with the basics: what got you into coaching and how long ago was that? Ben Trinder: I always wanted to work with and coach kids, I planned to do my coaching qualifications when I left school at 18. Unfortunately, that didn’t happen due to work commitments because like many 18 year olds money was a big attraction. I started out by helping my dad coach my younger brother’s team in 2002. He was managing as well as organising the team and wanted someone to do the football side. It was a perfect first step. I coached the boys for 3 and a bit seasons without any coaching qualifications but learned to look at the game from a new angle; I planned all my own sessions and really enjoyed the experience. I then fell out of football until 2010 when I decided to get qualified and do my FA Level 1. Since then I have been on several courses to educate myself and continue getting my qualifications. I’ve just completed my FA Youth Module 3 and I am currently on my UEFA B Licence with some great tutors and candidates down in Southampton. I like to stay fresh and keep challenging myself. BfF: Have you had any mentors in your career? BT: Yeah, I have a few mentors. I don’t think mentoring has to be an official thing; a mentor can be any coach at any level of the game who is willing to answer your questions and point you in the right direction. From when I started out with my dad I learned how to organise and manage a group of people. My dad is still someone I look up to and I definitely get my calm, relaxed temperament from him. He is a patient guy. More recently I have just finished working with a grassroots team called Kennet Valley in Reading. Two guys from there taught me a lot about the game; from desire, heart and passion to the tactical “chess” side of the game. Over the last three years I have “adopted” a top level mentor who is a well-known youth coach in the UK, Michael Beale. He has been great with me, I feel like I can ask him anything and that’s important for me as a developing coach. I’ve been lucky enough to watch Mike coach in different professional academies on a few occasions and I learn new things every time I chat to him. He is always open and honest and is someone I really look up to. Mentors are important for us as coaches. It’s great to have someone to bounce ideas off, to be able to say “what do you think of this…” and then get some constructive feedback. There are a few guys at the club I’m working for who are really good to chat to and learn from as well. I am a true believer in surrounding myself with open, honest and knowledgeable people to develop my own skills. BfF: What is your coaching philosophy? BT: It depends on age and ability really. I coach a good standard grassroots under 14’s team at Ascot United at the moment. In general I am a 4-3-3 fan. The 4-3-3 is adaptable, you can switch to a 4-2-3-1/4-5-1 or a 3-4-3 relatively easily. I like adaptability. I like pace in wide areas – full backs and wingers. I like a midfield three who are comfortable receiving and distributing the ball under pressure and can rotate positions between them. I’m not a fan of rigid team set ups. I like my team to attack with flair, creativity, skill and pace. I am a big fan of dribblers and creative boys and it’s important for them to be themselves: who am I to stop them doing what they do best? That applies to all the players I coach. I like to play a possession game, controlling the tempo of a game, but sometimes that’s not possible for whatever reason, for instance the pitch, the scoreline or the opposition. If that’s the case, I like the team to play on the counter attack, at speed with players interchanging positions. It’s unpredictable but that’s what I like. I also like my players to play with heart and a “never give up” attitude. Of course the players I coach will dictate the way we play to a certain extent, and that’s my philosophy in a nutshell. BfF: Is winning important for you? BT: I want to win but winning will never be the main aim for me. As long as the players are having fun and challenging experiences during each game then we’re on our way. We all want to win, young players included, it’s a competitive game after all and as coaches we shouldn’t try to remove that. Every kid wants to score a hat-trick in every game but we know that’s not possible. I see my job as an educator; someone to teach them the benefits of hard work, team work and a good attitude, which lead to the team playing well and hopefully winning. Kids, particularly in the early stages of their development, need to be supported, nurtured and guided – all of them. I’m a great believer in equal playing time and no favouritism towards so called more able players. Winning is important but we shouldn’t put any pressure on our young players to win. BfF: What are the most important attributes of players in your teams? BT: At grassroots level I like young players who are willing to learn and improve whilst a good attitude is important too. That’s all. As long as I can build a trusting relationship between myself and the players then the rest will come with time. I am there to develop their skills and help them improve regardless of their ability. BfF: You set up Coaching Family. What gave you that idea and what is it all about? BT: I wanted to connect coaches and to share good ideas and good practice. A central Twitter account seemed like a great way to do that. Although I founded the account, there were actually 20 odd coaches who I was speaking to about it back in 2010. I originally joined Twitter to see if any other coaches were using the social network site. After speaking to a few of coaches on there I decided to set up the Coaching Family account. The name actually came from one of my hashtags #coachingfamily and it does feel like a family on there sometimes. There were some top youth coaches involved in the early stages who gave me the confidence to go for it, they know who they are. The account has grown so much in the past year and I’ve now got a really good guy helping me run Coaching Family, Liam Donovan. He has been brilliant and he’s one of the most helpful guys you could wish to meet. BfF: What has the response been like? BT: It’s been unbelievable. We have close to 17,000 followers on there right now. That’s great in itself, but we want to involve everyone and I think we are on the way to doing that. Each day we get hundreds of coaches from all over the world who tweet us, asking questions, posting sessions and debating various topics. We have also asked coaches to get involved in submitting their own sessions so we can produce session sharing booklets. The booklets have been a hit, they are basic but they are templates for coaches to use and expand on. 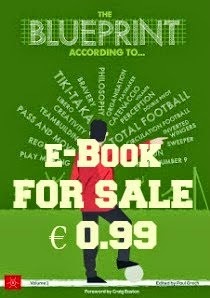 We also set up a website (coachingfamily.com) where coaches can read interviews, download our booklets and read various articles on coaching and the game. I think what’s made the idea work is the fact that it’s completely free. Where else can a grassroots coach, who is just starting out, contact a seasoned academy coach working at a professional club? I would encourage coaches to get involved on Twitter. It’s a great learning tool and great for taking charge of your own CPD and personal development. There are also several really good coaches who can double as mentors on there. That’s how I came into contact with Mike. We have a great community on there and it’s a positive community of coaches who are open, honest and willing to share their work and experiences. The more coaches we can connect, the better. BfF: How much is learned from attending coaching courses and how much is learned by observing other coaches? BT: Courses are very important as that’s how we get our valuable qualifications. Each course teaches us how to coach in a certain style to suit a certain level of the game. I have learned so much (as you would expect to) from attending the FA courses and I have made some very good friends on the journey. I think courses are only a part of our learning though. That’s why I think Twitter is so useful and a CPD tool. I think it’s important, if you’re serious about coaching, to read books, go and watch other coaches, talk to them and ask questions. It’s a valuable experience for any coach and you learn so much. I’ve been lucky enough to visit some top level professional youth academies in England, each experience is totally different and I have learned new things every time. It’s all about building contacts and speaking to people then taking the valuable information they give you to put into practice. BfF: If you could change one thing about football in England, what would that be? BT: The money clubs and players get in the professional game. I’d like to see some of that filter down to grassroots level to improve facilities and help fund the education of young coaches. With most coaching courses costing £200+ it’s difficult for some of these grassroots guys and girls to get qualified if they cannot get funding from their clubs. The FA are making steps to address that though. BfF: What do you want to achieve to be satisfied with what you have done in your coaching career? BT: I want to continue to enjoy helping young players develop their skills. I want to keep learning and developing myself as a coach. Coaching is a part time job for me at the moment and I would like to go full time somewhere soon. (At the moment I teach sport at a pupil referral unit in Reading full time) My aim is to one day work within a professional Academy set up in England, that’s the dream. I understand how competitive that area is though, and I have a lot of work to do before I can start thinking about a role like that. For now, I am happy. I am working part time with a professional club coaching at their academy development centres, plus coaching with the grassroots under 14’s at Ascot United. I’m also practicing for my UEFA B assessment that is coming up soon. Passing this course has been my aim since I started coaching. I don’t like looking too far into the future, but after the B licence I want to do my FA Youth Award assessment. One day I would like to do the A licence and possibly go into coach education. I don’t like making too many plans though, as long as I continue to work hard, enjoying coaching and get a buzz from it I’m happy.